I decided to do a quick unit on hibernation with my kinders before February is here. 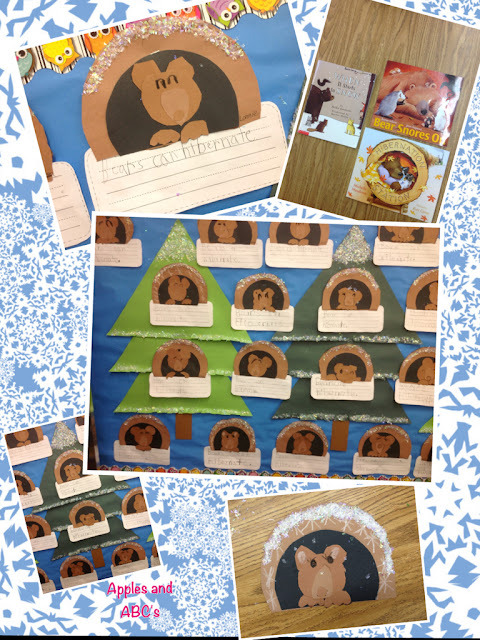 Here is a snapshot of our hibernation unit. You can pick up the template in my Teachers Pay Teachers store! I found some books in my classroom library that went along with the hibernation theme. I read one a day, leading up to our bear craft. The students made a little cave for their sleeping bear to be peaking out. We added fake snow glitter to the top of the cave to make it look like it was snowing! All of the students wrote the same sentence. Sometimes I let them choose what they want to write, but this time we were focusing on finger space and making the letters the correct size. We wrote each word together as a whole group while I guided the class through each letter. Here is our hibernation bulletin board. I used the same trees from my ornament bulletin board, I just added fake snow to them! This is so adorable. I forced Layla to take that picture and we are so cute in it. Why are you missing? Next time you better be in it! LOL! Too cute!!! I love that they're in little caves! This has got to be the cutest thing I've ever seen!!! So cute! I love cute writing ideas. They make the kids feel so proud.